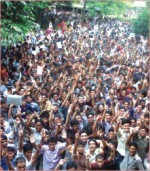 From the very first day of opening, the University of Dhaka proved itself as a premiere educational institution of this country. The quest for excellence it started from 1st July, 1921 with 60 teachers and 877 students, is now 85 years old. Currently it has 1,300 teachers and 30,000 students, comprises of 10 Faculties, 51 Departments and 9 Institutes. I had an offer to go for a trip to Rangamati with some of my friends. I was a little busy in the beginning of this Year, so when the proposal came to me I ignored it at first. Later on I agreed to go with them. It was a really wonderful trip. I would have missed a lot if I had turned down the offer. Right upon opening of classes, a great festivity of the Hindu religion was celebrated in different halls of Dhaka University. The most gorgeous and largest celebration was held in Jagannath Hall. 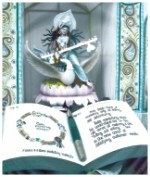 The festival is celebrated to pay reverence to Saraswati, the goddess of knowledge and learning with great enthusiasm.